This article is intended to understand environmental management accounting, its increasing importance, and new developments. The global profile of environmental issues has risen significantly during the past two decades, precipitated in part by major incidents such as the Bhopal chemical leak (1984) and the Exxon Valdez oil spill (1989). These events received worldwide media attention and increased concerns over major issues such as global warming, depletion of non-renewable resources, and loss of natural habitats. This study paper highlights on the utilization and benefits of using environmental management accounting for firms. In order to realize the uses and benefits of such a system, a framework is drawn to develop and implement an environmental management accounting system within an organization. The paper also compares and finds the difference between traditional financial accounting method and environmental management accounting to outline the importance of the later system in the current business environment. The research paper also discusses the methods of finding environmental costs and how the companies can accrue saving and generate revenues by separating environmental costs from general accounting. The paper attempts to find out the basic benefits companies can garner by adopting an efficient environment management accounting practice which has the primary role to lead a company in the path of progress through eco-friendly initiatives. 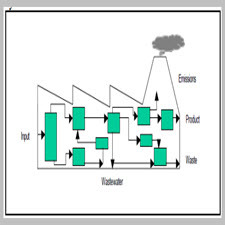 Furthermore, the research would validate the use of system in aiding management decisions regarding designing environmental friendly products, attuning production process and managing wastes. Although, environmental management accounting is a new approach to improve the environmental performance of a company, proper implementation of the system can assure transparency for the company to report the environmental costs clearly and help them in accessing their corporate social responsibility initiatives as well. All this, in turn enhance the image of the company in the media as well as amongst its shareholders. In today’s globalized economy, companies have become too competitive and are even using unethical means to pip the other firms in the race. The greatest concern these days have been on the effect of environment that these companies are putting to earn higher revenues and increasing their bottom line. Thus, government, non-governmental organizations as well as the general public are increasingly putting pressure on the companies to become responsible towards the environment and invest substantial amount of money and effort to protect the environment. این مقاله در نظر گرفته شده برای درک حسابداری مديريت محيط زيست، اهميت در حال افزايش آن و تحولات جديد است. مشخصات جهانی مسائل زیست محیطی در دو دهه گذشته به طور قابل توجهی افزایش یافته است، که به طور ناگهانی رخ می دهد به علت حوادث مهم مانند نشت شیمایی در بوپال (1984) و نشت نفت Exxon Valdez (1989). این رویدادها توجه رسانه های دنیا را به خود جلب کرده و نگرانی ها را نسبت به مسائل عمده مانند گرم شدن کره زمین، کاهش منابع غیر قابل تجدید و از دست دادن زیستگاه طبیعی افزایش داده است. این مقاله مطالعه بر بهره برداری و مزایای استفاده از حسابداری مدیریت زیست محیطی برای شرکت ها است. برای درک استفاده و مزایای چنین سیستمی، یک چارچوب برای توسعه و پیاده سازی یک سیستم حسابداری مدیریت زیست محیطی در یک سازمان طراحی شده است. مقاله همچنین مقایسه و تفاوت بین روش حسابداری مالی سنتی و حسابداری مدیریت زیست محیطی را به منظور تعیین اهمیت سیستم بعد در محیط کسب و کار فعلی مقایسه می کند. این مقاله همچنین روش های تعیین هزینه های زیست محیطی و چگونگی تلفیق شرکت ها با درآمدهای ناشی از جدا کردن هزینه های زیست محیطی از حسابداری عمومی را مورد بحث قرار می دهد. این مقاله تلاش می کند تا مزایای اساسی را که شرکت ها می توانند با اتخاذ یک کار حسابداری مدیریت کارآمد محیطی که نقش اصلی را برای هدایت یک شرکت در مسیر پیشرفت از طریق ابتکارات سازگار با محیط زیست داشته باشد، بدست آورد. علاوه بر این، این تحقیق، استفاده از سیستم را در کمک به تصمیم گیری های مدیریتی در مورد طراحی محصولات محرک محیط زیست، تنظیم روند تولید و مدیریت زباله ها مورد تایید قرار می دهد. اگرچه، حسابداری مديريت زيست محيطی يک رويکرد جديد برای بهبود عملکرد زیست محیطی یک شرکت است، اجرای مناسب سیستم می تواند شفافیت را برای شرکت فراهم کند تا به طور مشخص هزینه های زیست محیطی را گزارش دهد و همچنین به آنها در دستیابی به ابتکارات مسئولیت اجتماعی شرکت های خود کمک کند. همه این ها، به نوبه خود، تصویر شرکت را در رسانه ها و همچنین سهامداران آن افزایش می دهد. در اقتصاد جهانی امروز، شرکت ها بیش از حد رقابتی شده اند و حتی با استفاده از روش های غیر اخلاقی، شرکت های دیگر را در مسابقه می گیرند. بزرگترین نگرانی این روزها بر اثر محیطی است که این شرکت ها درآمد بیشتری را به دست می آورند و خط پایین آنها را افزایش می دهد. بنابراين، دولت، سازمان های غيردولتی و عموم مردم به طور فزاینده اي بر شرکت ها تاثير مي گذارند تا در برابر محيط زيست مسئوليت ببينند و مقدار قابل توجهي پول و تلاش براي حفاظت از محيط زيست بپردازند.